(Photo: REUTERS / Mike Hutchings)Archbishop Emeritus Desmond Tutu waves to well-wishers after a "Procession of Witness" march to Parliament in Cape Town April 19, 2014. The march was called by religious leaders to defend the role of the public protector in exposing corruption and poor governance, and to express their concern over other issues affecting local communities. Public Protector Thuli Madonsela, South Africa's top graft watchdog, said in a report last month President Jacob Zuma should pay back some of the money spent on upgrades to his Nkandla home, which included a chicken run and swimming pool. 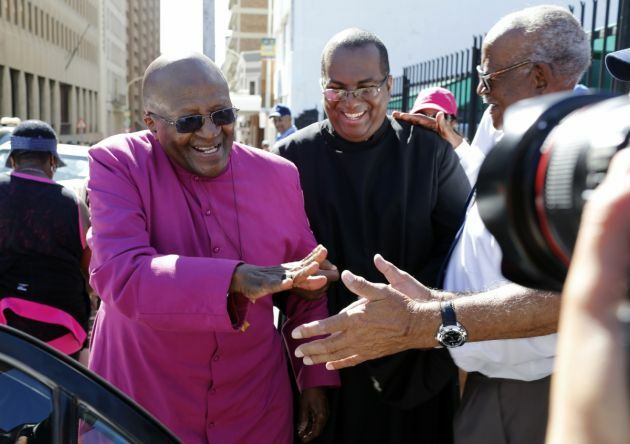 Desmond Tutu and a successor of his as South African Anglican leader, along with other faith leaders have marched in Cape Town to commemorate 20 years of democracy and also to highlight distrust in the government. Leaders of South Africa's Christian, Jewish and Muslim communities called on their followers to join the "Procession of Witness" led by South African Anglican leader, Archbishop Thabo Makgoba, on April 19. They demanded, "A change in the practice and behaviour of all parliamentarians, captains of industry and commerce; and; that all those, in all sectors of society, who have influence and power, return to Nelson Mandela's way of governance and leadership." 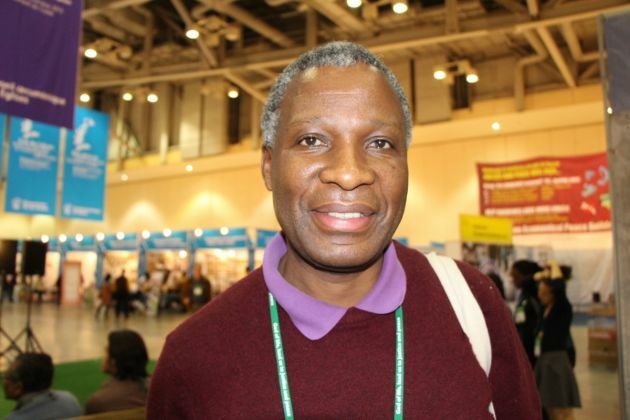 Other Christian leaders who took part included the national moderator of the Uniting Reforming Church of Southern Africa and Africa president of the World Council of Churches, Rev. Mary-Anne Plaatjies-van Huffel. "We, the faith community, confess our silence over many years, and our failure to respond compassionately to God's cry in the lives of the people of our land - especially those who are poor, naked and those denied their daily bread," said Makgoba outside the South African Parliament. "How long must South Africa live out its daily existence suffering from such a lack of transparency? Real transparency is an essential ingredient for trust... the absence of transparency results in a withering, pervasive weight of distrust taking over." Tutu who took part in the march to South Africa's Parliament praised Makgoba and religious leaders for organizing the procession. "I am proud of my young successors and the other religious leaders to give their inspiration for us to our beautiful land," said Tutu. Archbishop Makgoba said, "While the procession is open to all, including members of political parties, it will be led by religious leaders and no party political banners will be permitted." A key concern of many South Africans is the way South African President Jacob Zuma skirted criticism over a $23 million government-funded security upgrade to his private home. Public Protector Thuli Madonsela, whose office investigates corruption, said Zuma had engaged in behavior "inconsistent with his office" and said he should pay for some of the renovations at his private home in Nkandla that included a chicken run and a swimming pool. South Africans go to the polls on May 7 for the country's fifth national elections since the first universal suffrage poll of 1994 which put Nelson Mandela and the African National Congress into power. A poll by the Sunday Times newspaper on April 20 showed that despite widespread worries about a culture of corruption the ruling ANC is set to retain a two-thirds grip on votes. "Mr. President, how you are remembered in history, your legacy, is going to be determined by how you speak to the nation about how you made the decisions you have made," Makgoba told the procession. (Photo: Ecumenical News / Peter Kenny)The Anglican Archbishop of Cape Town Thabo Makgoba on November 6, 2013 at the World Council of Churches 10th Assembly in Busan, South Korea. In an Easter Sunday sermon the Anglican Archbishop called on South Africans to use their right to vote, responding to a campaign by disillusioned ANC members to spoil ballot papers. "Too many people have suffered and died for us to stay away from the polls out of apathy," said Makgoba in his Easter sermon at St. George's Cathedral in Cape Town. "I want to make a call to all Anglicans in our country to exercise their hard-earned privilege and right to vote. After prayerfully reflecting on the party you want to vote for, please go to the polls and vote. "And vote we must: too many people have suffered and died for us to stay away from the polls out of apathy." He said there would be "dozens" of parties to choose from and urged people to examine their policies and their behavior. "Above all, let us engage with our consciences and be guided by these rather than by fear and blind loyalty when we make our mark on the ballot paper."